From one week to the next, Reviews from R’lyeh writes reviews of new games and supplements with an emphasis on Call of Cthulhu and other games of Lovecraftian investigative horror. This series concentrates on Call of Cthulhu and other games of Lovecraftian investigative horror, but not those recently released, but those of the past. There have been innumerable titles published over the years and this is an opportunity to appraise them anew, often decades after they were first released. The series begins with perhaps one of the most important scenarios ever published for Call of Cthulhu. For it is important to note that without Trail of the Loathsome Slime, Chaosium might never have published Cthulhu Now, and that without Cthulhu Now, Pagan Publishing, might never have published Delta Green. The genesis of Trail of the Loathsome Slime though, began with author Marcus L. Rowland, now best known for his RPGs, Forgotten Futures and Diana: Warrior Princess. During the 1980s he was known as a prolific contributor to the British roleplaying magazine, White Dwarf, writing numerous scenarios and articles, many of which still stand up to scrutiny a quarter of a century later. 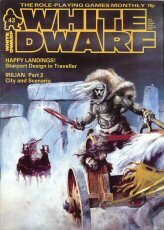 White Dwarf had started in 1979, but it would be four years before it would provide any support for Call of Cthulhu, a roleplaying game which by then was two years old. That first support would be “Cthulhu Now! - Call of Cthulhu in the 1980s”, which appeared in White Dwarf #42 (June 1983), followed by “Cthulhu Now! - Part 2: Mini-Scenario outlines for Call of Cthulhu in the 1980s” in the next issue. The first part focused on skills and weapons, whilst the second outlined Dial 'H' for Horror, Trail of the Loathsome Slime, and Cthulhu Now! as mini-scenarios. Marcus L. Rowland’s two-part series set the tentacles of the Call of Cthulhu community aflailing. For as a roleplaying game, Call of Cthulhu was then a historical piece. It was set in the Roaring Twenties, the same period when most of H.P. Lovecraft’s fiction was written. The idea that it could be set in periods other than that of the 1920s and especially one that the readers of White Dwarf – myself included, White Dwarf #42 being my first purchased issue – were intimately familiar was a revelation. The popularity and the feedback on the series was enough to get Games Workshop to ask Rowland to write a scenario for publication based on the material he had published in White Dwarf. The result was Trail of the Loathsome Slime, a scenario published for contemporary Call of Cthulhu in 1985 that would prefigure Chaosium’s Cthulhu Now by two years. The scenario primarily takes place in the South Atlantic in late 1983, early 1984, not long after the conclusion of the Falklands Conflict, but it begins in London. The investigators are contacted by Russell Corey, an American clairvoyant and investigator of the occult and the mysterious, although not necessarily of the Mythos. He has revelations that he wishes to share, but by the time that the investigators make the agreed upon appointment, Corey is dead and the police have the building cordoned off. Getting into Corey’s flat to find out what he wanted to share is the scenario’s first challenge. If the investigators are successful, then they learn that Corey believed that the disappearance just before the Falklands Conflict, of the Delta Pioneer, a research vessel belonging to the British Bird Preservation Society is connected to the activities of a Satanist who was executed in 1927. Corey’s researches had revealed that the Satanist was on Griffon Island in the early 1920s, the very island where the Epsilon Pioneer, the sister ship to the Delta Pioneer, is headed in the New Year. Located in the British Antarctic Zone, Griffon Island is home to the Lesser Barbed Penguin, the population of which was reduced by an oil spill the decade before and the recovery of which, the British Bird Preservation Society monitors annually. To support Trail of the Loathsome Slime, several new skills are reprinted from White Dwarf #42 – including the use of Phone Phreaking, which certainly dates the affair. The scenario’s maps and plans are very clear, and the three hand outs are nicely done, one reflecting the computer technology of the time. That said, another hand out, that of a pamphlet from the British Bird Preservation Society about its work on Griffon Island would have been a nice addition. There would have been space as some of the hand outs and maps take more space than they really need to. In addition, the scenario does include notes on converting it to the 1920s, essentially transforming it into a much simpler scenario with little in the way of technology for the investigators to rely upon. It should also surprise no one that it also has the feel of a period piece, as evidenced in particular by the description of the computer technology, let alone some of the minor events that occur because of where the scenario is primarily set. 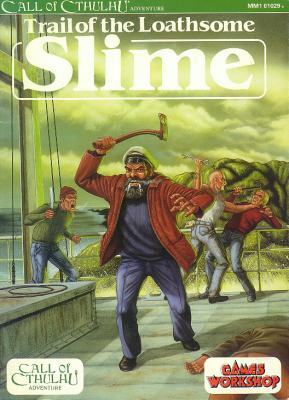 For the most part, Trail of the Loathsome Slime is an action orientated affair, whether that involves breaking into Corey’s cordoned off flat, fighting off the frenzied crew and passengers of the Epsilon Pioneer, or facing down the true danger to be found on Griffon Island, with relatively little in the way of investigation. The challenges it presents in the early parts of the scenario suffer from having too few solutions, at least as written, and as consequence, a Keeper might be forced to hand waving those obstacles should the players roll badly. Also, it is perhaps too straight forward a scenario and feels very much like an early effort upon the part of an author whose later work would show more depth, more detail, and more sophistication. 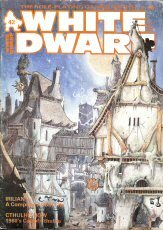 “Draw the Blinds on Yesterday” (White Dwarf #63) and “Curse of the Bone” (White Dwarf #86) are both highly regarded examples of Rowland’s later scenarios and showcase Rowland's writing to better effect. At its heart, Trail of the Loathsome Slime still has the feel of a magazine scenario. Which is no surprise given its origins as an outline in White Dwarf #43. It thus feels underwritten more than anything else, but a Keeper today would no problem expanding upon the scenario given wealth of research material he would have at his fingertips. Nevertheless, Trail of the Loathsome Slime is certainly not without its charms, and of course, there is the matter of the title and in that, Trail of the Loathsome Slime is simply joyous in its use of a bad pun. The title is a pun? That's passed me by all these years. I wonder if the Griffon Island location is a nod to RuneQuest? It seems like too large a coincidence. The title is a pun on Laurel and Hardy's Trail of the Lonsome Pine. As to the Griffon Island-Griffin Mountain/Island connection, I could not comment. Wow. I can't believe I missed that all along. Great review, keep them coming!